PVadapt is an EU Innovation project submitted and approved under call topic LC-SC3-RES-6-2018 (Demonstrate significant cost reduction for Building Integrated PV [BIPV] Solutions) (Grant Agreement No. 818342). The overall goal of the project is the delivery of a prefabricated, modular and multifunctional turn-key BIPV system. This construction method will reduce the complexity and costs of the BIPV systems, maximizing in this way their accessibility. 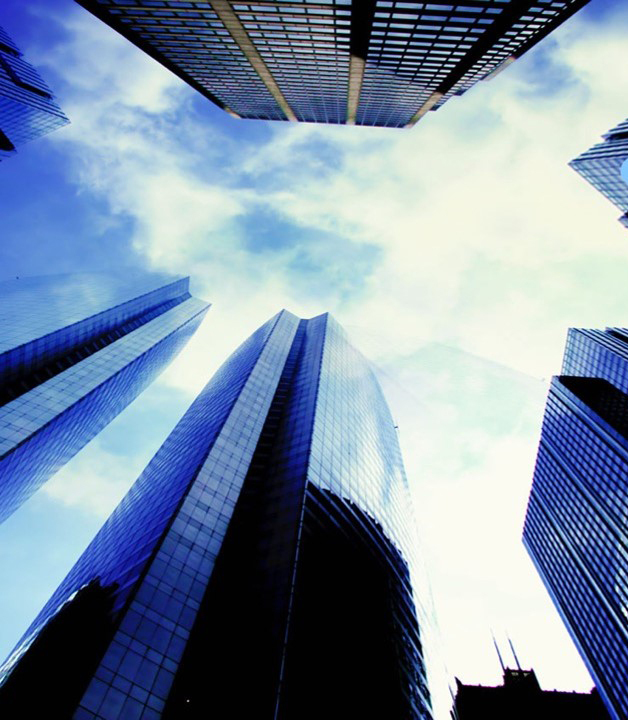 Achieving a substantial reduction of the BIPV costs would trigger the penetration of BIPV in the building sector, contributing therefore to the creation of new opportunities and the diversification of the European PV manufacturing industry. The project is further expected to contribute to the implementation of policies towards Zero-Energy Buildings. 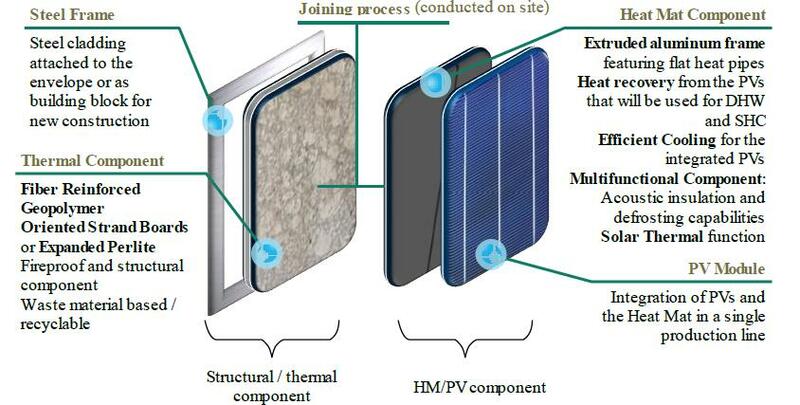 The two component integrated BIPV system will be produced separately and an assembly/joining method will be developed for on-site integration. The Structural & Thermal components feature a construction grade steel frame and a Thermal Component based on three main material formulations. The second part of the system consists of a Heat Mat bonded to PV modules. The combination of the two will produce “building blocks” of sufficient customization to allow components suitable for roof and façade installations, as well as new construction. The first pillar is the delivery of a PV/T component active energy component comprised of a sheet of flat heat pipes (Heat Mat-HM) in a PV module. The second is the delivery of a prefabricated structural panel with multiple passive functions (thermal, resilience, stability, waterproofing among others). The third is the delivery of a Smart Envelope System, achieving critical functions such as load prediction and shifting and predictive maintenance. Finally, producing an environmentally and financially viable result. Throughout the whole project, principles of sustainable design will be applied to all levels of product development, including production processes, installation, maintenance, dismantling and reuse/recycling of the components. The design process will be based on the Cradle to Cradle® Criteria for employment of non-toxic materials, optimised environmental performance and circular utilization of materials. The project joins together 18 partners from 10 European countries (Norway, Spain, UK, Ireland, Italy, Belgium, Portugal, Austria, Greece and Germany) consisting of 5 research organizations, 3 large enterprises and 10 SMEs. A number of 8 demonstration sites across 4 EU member states (two in Spain, one in Austria, four in Greece and one in Portugal) has been planned to showcase the advantages of PVadapt in a convincing fashion. alchemia-nova’s office building in the 14th district of Vienna is one of the demonstration sites. The building functions as a showcase model for a number of buildings in Austria, as there are many buildings built at the turn of the century. The goals are to transform this house built at the turn of the century with energy class C/D into an energy efficient building, to set up a demonstration building for circular economy and innovative building materials and to present innovative solutions in the building sector to relevant national and international stakeholders (scientific and non-scientific community, architects, developers, municipalities, service companies, service providers etc.). The building is also a demo site in the H2020 project HOUSEFUL and represents therefore an excellent opportunity to evaluate the synergies between BIPV and circular economy such as nutrient recovery from wastewater. 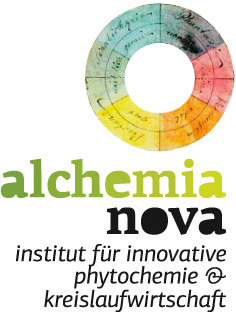 alchemia-nova will also be responsible for tasks like the circularity design specifications, Oriented Strand Boards (OSB) production from agricultural waste, secondary building blocks and adaptability with NBS, the Environmental Technology Verification, value chains and sustainability branding.